QUOTE TO REMEMBER "An athlete is a normal person with the gift of an undying passion to be the best and achieve greatness." Making 4 zone time cuts outstanding meet for Tyler N.
Choose a "Club" from the drop-down menu. Congratulations to the Manta Rays first ZONE swimmer TYLER N. 200 IM GREAT JOB!!!!!!!! Congrates to everybody who went to Div 2s I'm very proud of you all. Khris W. way to get that double A cut and making the Div 1 cut as well and what can I say about the new swimmers WOW fist time at Divisions and Nic made finals alternate and what about the girls Lauren 5th in 50 breast Kadie 4th in the hundred breast and Olivia 5th in the hundred fly. What a way to start off your swimming career. Thats awesome Ok everybody. We made it through the first week. I told all of you that it was going to be the hardest 2 weeks of practice yet. We only have one more week and it shoud be getting better. I would like to remind everybody that as we get more tired our tempers become shorter we need to remember that we are a team and everybody feels the same way you do reguardless. Stay focused on the big picture.I will get you there. Coach Mike Well over all, the past 2 meets have been incredible. We had 34 best times several Div 2 quilifiers and some Div 1 quilifiers Tyler N. made 2 AA cuts over the last 2 meets Congratulations Tyler. We have Just one more meet till the Div 2 championships everybody needs to stay focused and and give 110% at practice. Im very Proud of this team and there success. I usually Dont put to much into ribbons but for those who recieved them from the Springfield meet these were well earned GREAT JOB!!!!!!!!!!! Any USA swimmer 9 or over needs to bring a pair of old tennis shoes to practice. Make sure that you dont want to ever use the shoes again, you will need to start bringing them to every practice starting Monday the 28 day of Jan. If you dont have any you can check with the light house shelter or butterfields they may have some. There is no excuse for not having them on Monday even if I'm not there I hope everybody had as much fun at the movie night as I did Although the movie wasn't the best the ping pong was a blast Just ask Tyler as well as the other games. Use the fourm section and post other ideas as to what else you all would like to do Two Manta Rays picked for regional all-star meet Thursday, January 10, 2008 News Paper Artical Two members of the Salt Fork YMCA Swim Club have been selected to compete in the 24th annual Midwest All-Star Age Group Invitational, set for Jan. 19-20 at Lawrence, Kan. Christian F. (center) and Tyler N. (left) will represent the Missouri Valley Local Swim Club (LSC), the regional USA Swimming organization of which the Manta Rays are a member, against contestants from Missouri and five other states: Colorado, Iowa, Nebraska, New Mexico and South Dakota. Christian F. is among the region's top 10-and-under boys' swimmers in four events: the 50-yard freestyle, 50 and 100 breaststroke and 100 individual medley. He's also been chosen as part of the club's 200-yard free and medley relay teams. 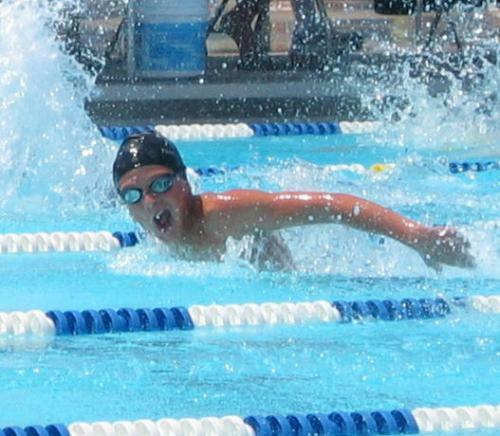 Tyler N. is entered in the 100 and 200 breast and the 13- and 14-year-old boys' 400-yard medley relay. Salt Fork coach Mike Ballard (right) will also be at the meet as Coach of the Missouri Valley LSC's 13-14 boys age group team. (check out photo in photo section) SALT FORK YMCA MANTA RAYS NEWSLETTER The Manta Ray Swim Team would like to welcome all the new swimmers joining us this week. Don�t forget there will be a movie night this Friday the 11th at 7:00p.m. Swimmers are welcome to bring a snack. Mailboxes are now being used for swim team notes, newsletters, meet information, calendars, etc. Please check your box daily. If you would like this information emailed to you as well, make sure Kris M. has your email address. T-shirt orders will be taken until January 22nd. Order forms are in the mailboxes, and there is a picture of the t-shirt design on the lobby window. Raffle tickets are being given to the swimmers. The drawing will be held at the February 16th Invitational meet. Winners do not need to be present to win. There will be incentives for the top three ticket sellers, so get out there and sell! If you need more tickets, see Kris M. Congratulations to Tyler N. and Christian F., who made the Missouri Valley Swimming All-Star Team. Way to swim boys!! There will be a parent meeting on January 22nd at 5:00p.m. in the YMCA Social Room regarding the Feb. 16th Invitational swim meet. Please plan to attend; we will need everyone�s help to run this meet! !